It's your home -- it should be about YOU. Looking to sell your home? We will listen carefully to your expectations and goals and work with you to achieve asking price success with low on-market days. Buying a home? We will focus on understanding your home needs and desires and with our market knowledge and experience, we pledge to help you find and successfully purchase your perfect home. Sharon McFarland had a desire to become involved as a real estate consultant/sales person during the process of 8 corporate moves. As a Gear for Sports retail manager then, one of her customers, Steve Shumate, pursued her to come work as a buyer�s agent for his real estate group. He gave her great training and soon she was helping represent both buyers and sellers and loving it. That was the beginning of her love for real estate and working with clients � a perfect marriage of relational with business. Because she knows it is such an important financial investment and a source of emotional good, she considers it quite a privilege to be entrusted with the opportunity to help her clients, friends, family and referrals in this process. In addition to real estate, she is married to Doug McFarland, a wonderful learning disability teacher at Horizon Academy, a private clinical school. She has two adult children, two adult step-daughters and 7 terrific grandchildren. Her 92-year-old mother lives with she and her husband. Family is very important in their daily lives. She and Doug are very involved with Heartland Church, serving in many areas for the past 20 years. They are big sports fans and especially support the local teams and as KU graduates, they are avid Jayhawk basketball fans. Suzanne Vaughan grew up in the Kansas City area before going to Baylor University to earn a BA in Psychology. She then went to the University of Kansas for a Masters in Business Administration (MBA) with an emphasis in Human Resources. She has sold real estate for the past 16 years with various companies in KC. She has a wonderful husband and 3 amazing and busy children. She has lived on both sides of the state line and in several areas of the Kansas City area for most of her life. She loves the process of forming relationships with her clients and helping them to find just the right home for them! Tonja Sell has had an interest in homes since childhood when she organized a Tour of Homes fundraiser in junior high. She graduated from Buena Vista University with a BA in Marketing, then spent over 15 years working for John Deere where her passion for homes and real estate was reignited through 6 corporate moves. She is enthusiastic about using her marketing, project management and consulting skills, with her passion for homes and building relationships, to help clients find a home that fits their lifestyle and guide them through the process. 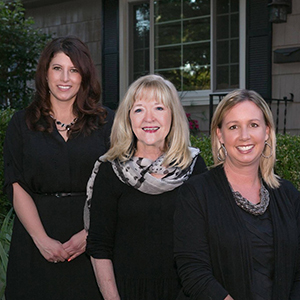 Sharon sold our house in De Soto in a short amount of time, then helped us find the perfect home in Roeland Park. We love our new home and we love Sharon! Sharon is tough when she needs to be. She knows her business and takes good care of her customers. Sharon and Marty did a great job of selling my sister-in-law’s home after she passed away. They were very knowledgeable and helpful through a difficult process. I live out of town, so they took care of all the details and sold it quickly. I would recommend these two ladies to anyone who needs to buy or sell a home! Thank you!